My first morning at Chaco Canyon I was walking from the visitor’s center to Una Vida ruins a few hundred yards away. A silver sheet of stratus clouds covered the sky. The clouds retained brightness and were not thick enough to turn the undersides dark. The light was flat and all of the colors held their own intensity, none demanding more attention with showy sunny brightness. I kept looking at the plants as I walked. The colors, muted as they were, seemed to be glowing to the point of vibrating – at times. It was incredible, and of course didn’t translate photographically. After about half an hour I realized I needed to tip my head forward enough for the brim of my hat to cut out the sky for the affect to be detectable. A similar thing happened to me at the Grand Canyon in similar light, where if I blocked the sky at the horizon the whole canyon took on a flat, muted look. Blocking the sky also had the effect of reducing apparent visual distance, meaning the layers of the canyon became compressed and at times it appeared as if I were looking at a two dimensional print and not the real place. The affect, known as the adjacency affect is a phenomenon in the brain when a large area of bright is placed next to a large area of dark. The juxtaposition of the two create a lightness on the adjacent dark and a darkness on the adjacent light along their common border. The same effect occurs with colors, not just tones. With colors one will affect perception of the other by affecting its hue or tone. You can see this in the image above where the central color is exactly the same, but the adjacent color affects our perception of it, changing its appearance and vice versa. The colors in the center of the boxes are exactly the same. This can be tested with a color picker in a graphics program. In Chaco it was the color affect. If the sky was in my view it sucked intensity from the colors of the bushes. If I tipped my head bringing my hat brim down to block the sky, the affect occurred. None of the colors was actually changing only my perception of them. This concept was used by photo engineers when designing software to sharpen images. Overdone digitally it causes the ghosting you see on badly processed jpg files. Once I got away from the Colorado Plateau deserts and into the Rockies proper the Earth served up a different stew plant wise, thicker and more diverse in size and color. Here there was more complete ground cover. Unless heavily trampled the ground is a confusion of flowers, short shrubs, tree seedlings, and the occasional berry bush when near moisture. Where the pine trees have been burned or logged the absence of a tree canopy opens up the sky. This allows the Aspen (poplars) to take hold. In the burned areas along the road to the Walhalla Plateau the immature Aspen are so thick on the slopes you can’t see the ground in places. And, this is before they have begun to bud and leaf. I read where an aspen will seldom stand alone, if there is one there will be many. It was recently discovered that akin to cattails and creosote, the Aspen groves you see are likely all one organism. They are attached to one another through their roots system and sent up shoots as the roots spread. One tree can share excess nutrients with a neighbor if need be. All members of an organism will leaf out in concert, while a neighboring organism may wait some time before leafing. Two organisms growing in close proximity or even overlapping will leaf out separately. It may be that many tree species act similarly. Tiny red Dwarf monkey Flower and orange Dwarf Buckwheat. 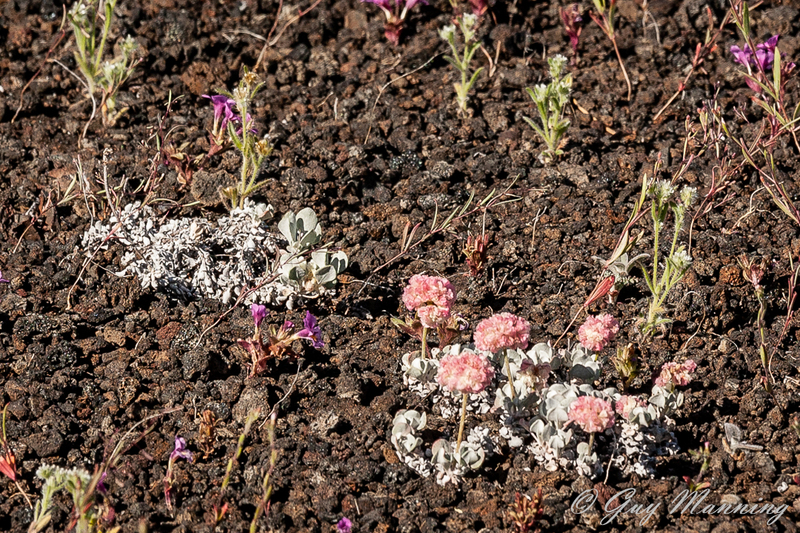 Cinder cone colored by wildflowers. 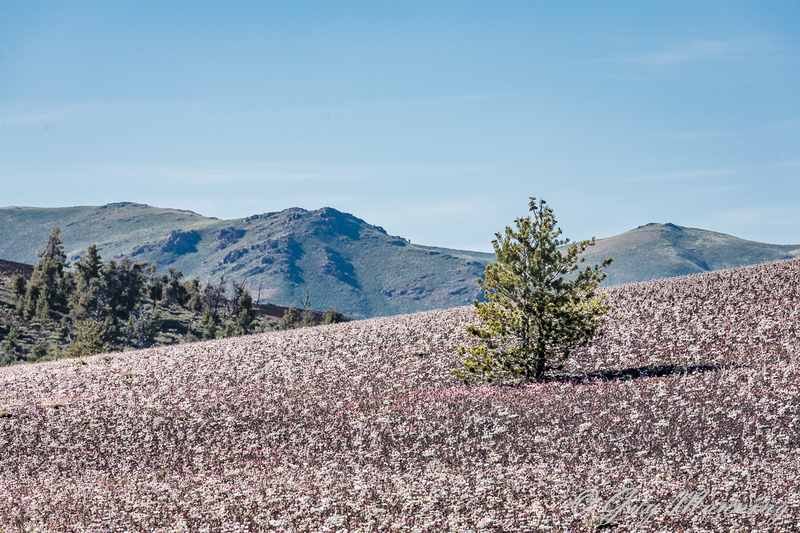 In the Craters of the Moon National Monument and Preserve, hills are mostly cinder cones of volcanic pumice. Each spring these black hills take on color. 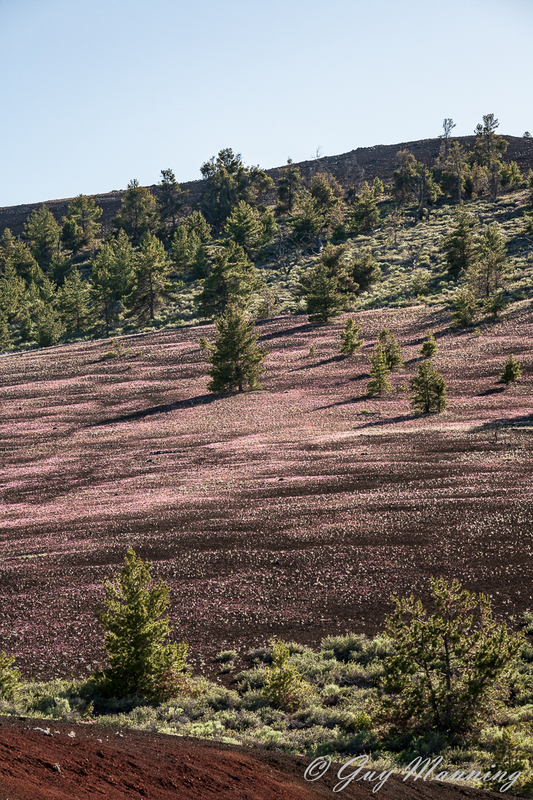 Many of the hillsides become purple. Among others, the Dwarf Monkeyflower is the main culprit. Mixed in you will discover many white to pink or orange Dwarf Buckwheat flowers. These have a root system that spreads as much as 3 feet for a six inch wide flower bunch. In affect they take over a wide area from which to collect their moisture. This prevents other Dwarf Buckwheats from growing on their turf. According to one of rangers, people have asked if the Buckwheats had been hand planted because of the lack of bunching that is seen in other flowers. At least 50 species of wildflowers exist here, I couldn’t find a definitive number. Keep in mind these diminutive plants are adapted to the 150 degree plus temperatures existing on the ground in the hottest seasons. Osprey landing on its nest. Near Glacier National Park I saw what I thought might be an eagle’s nest along the shore of Hungry Horse Reservoir. Using my 70-200 mm lens I was able to get photos of an adult bird landing on the nest. The next morning I stopped again and took some shots with the 1.4 Adapter on the lens. This took my maximum telephoto out to 280mm. This allowed me a bit more leeway with cropping which I had to do for the photo to work. The images here are cropped to less than 10% of the entire frame. With that done I was able to ID the bird as an Osprey through the identifying traits of the under-wing pattern and the Bart Simpson haircut. You can see the two young birds in the image on the right. The east side of Glacier National Park was the high point of flowers, most notable for the concentration of wildflowers on the slopes in the Many Glacier area. Underfoot was a semi firm mat of decaying stalks, roots, and blossom petals. If you were to fall down it would feel as if falling on a firm couch, assuming you didn’t land on wild roses. Stopping at a trail head I took time to wander in the field. I took in the dense dance of color as hikers, and two wranglers with a string of 12 horses and occupants, came and went along the trail. No one commented on the wildflowers. I don’t understand how they could ignore them. The trail wound through the spectacle for nearly 1/2 mile. I picked out an area approximately 100 feet square and started photographing the separate species. I found 20 different types when I reviewed the day’s photographs. Frankly this was among the most gratifying stops I have made on my journey to date. I am forced to be thinking of the future somewhat. I will likely lag in the north until I am uncomfortable enough with the season that the long trek to the south becomes a necessity. But there is a next year. And I will again have to decide a path, or at least a direction. Following the wildflowers will be on the list of possibilities. Prarie Smoke (Old Mans Whiskers).